NOAA scientists project that this summer’s Gulf of Mexico hypoxic zone or ‘dead zone’ – an area of low to no oxygen that can kill marine life – will be about the size of Connecticut. In a statement released June 7, 2018, NOAA said scientific models suggest that this summer’s Gulf of Mexico hypoxic zone or “dead zone” will be approximately 5,780 square miles (14,760 square km), about the size of the U.S. state of Connecticut. That’s similar to the 33-year average of 5,460 square miles (14,140 square km), and smaller than 2017’s Gulf dead zone – which at 8,776 square miles (22,730 square km) was the largest measured since mapping began in 1985. Hypoxic zones – aka “dead zones” – are areas in the ocean of such low oxygen concentration that animal life suffocates and dies. 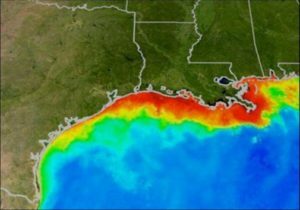 A dead zone forms in the Gulf of Mexico every summer. Nutrients from the Mississippi River watershed, particularly nitrogen and phosphorus, fertilize the Gulf’s surface waters to create excessive amounts of algae. When the algae decomposes in the deepest parts of the ocean, it leads to oxygen distress and can kill organisms even in the Gulf of Mexico’s richest waters. These low oxygen conditions threaten living resources including fish, shrimp and crabs, which humans depend upon for food and industry. Scientists deploy a sensor to collect water to test oxygen levels in the Gulf of Mexico. Image via NOAA. An oxygen-starved hypoxic zone – commonly called a dead zone – shown in red, forms each summer in the Gulf of Mexico. Fish and shellfish either leave the oxygen-depleted waters or die, resulting in losses to commercial and sports fisheries. Image via NOAA. The Gulf’s recurring summer hypoxic zone continues to put important habitats and valuable fisheries at risk. 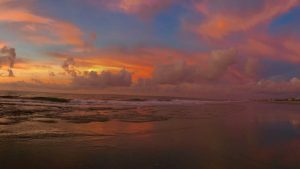 Although there has been some progress in reducing nutrients, the overall levels remain high and continue to strain the region’s coastal economies. Bottom line: NOAA scientists project that the 2018 summer hypoxic zone or ‘dead zone’ in the Gulf of Mexico will be about the size of Connecticut.